Niema, 3, sits while her mother washes clothes along the outer fence of the UN Protection of Civilians Site that houses over 30,000 displaced people in Wau, South Sudan. Children are more than twice as likely as adults to live in extreme poverty, with nearly 385 million children worldwide experiencing that condition, according to a new analysis from the World Bank Group and the United Nations Children’s Fund (UNICEF). “Children are not only more likely to be living in extreme poverty; the effects of poverty are most damaging to children [...] and the youngest children are the worst off of all, because the deprivations they suffer affect the development of their bodies and their minds,” said UNICEF Executive Director Anthony Lake in a news release. “It is shocking that half of all children in sub-Saharan Africa and one in five children in developing countries are growing up in extreme poverty. This not only limits their futures, it drags down their societies,” he added. The report, titled Ending Extreme Poverty: A Focus on Children, released yesterday, finds that in 2013, 19.5 per cent of children in developing countries were living in households that survived on an average of $1.90 a day or less per person, compared to just 9.2 per cent of adults. Globally, almost 385 million children were living in extreme poverty. The youngest children are the most at risk – with more than one-fifth of children under the age of five in the developing world living in extremely poor households. The new analysis came on the heels of the release of the World Bank Group’s new flagship study, Poverty and Shared Prosperity 2016: Taking on Inequality, which found that some 767 million people globally were living on less than $1.90 per day in 2013, half of them under the age of 18. “The sheer number of children in extreme poverty points to a real need to invest specifically in the early years – in services such as pre-natal care for pregnant mothers, early childhood development programs, quality schooling, clean water, good sanitation, and universal health care,” said Ana Revenga, the Senior Director responsible for poverty and equity issues at the World Bank Group. “Improving these services, and ensuring that today’s children can access quality job opportunities when the time comes, is the only way to break the cycle of intergenerational poverty that is so widespread today,” she added. 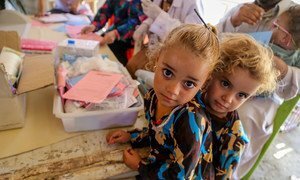 Several weeks before of the start of the new school year, the United Nations Children’s Fund (UNICEF), together with the Iraqi Ministry of Education, launched a nationwide ‘Back to School’ campaign in 10 governorates.